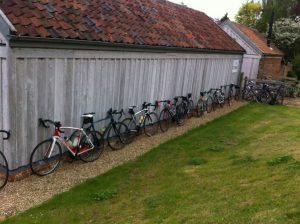 This weekend we hosted Ipswich Bicycle Club on Saturday and what a lot of them there were! Hopefully we got everyone fed with cake and coffee without too much delay. My only regret afterwards was that I didn’t get to chat to many of them. Sunday I was really pleased to have a couple of early birds in for breakfast and espresso. I really like being around early but up to now nobody has been in before about ten. We had cyclists in from both Manningtree and West Suffolk Wheelers as well as some smaller groups. The table football raised some interest and it will make a reappearance this weekend if the weather is good. The orange polenta cake with raspberries might also be back!